And what a packed day it was. It all started with lean coffee facilitated by Matt Heusser, which was both enjoyable and insightful (the picture above is the discussions we were having, taken by Lisa Crispin). My main takeaway from this session was the importance of being able to verbalize your skills to yourself, and to communicate them to others. 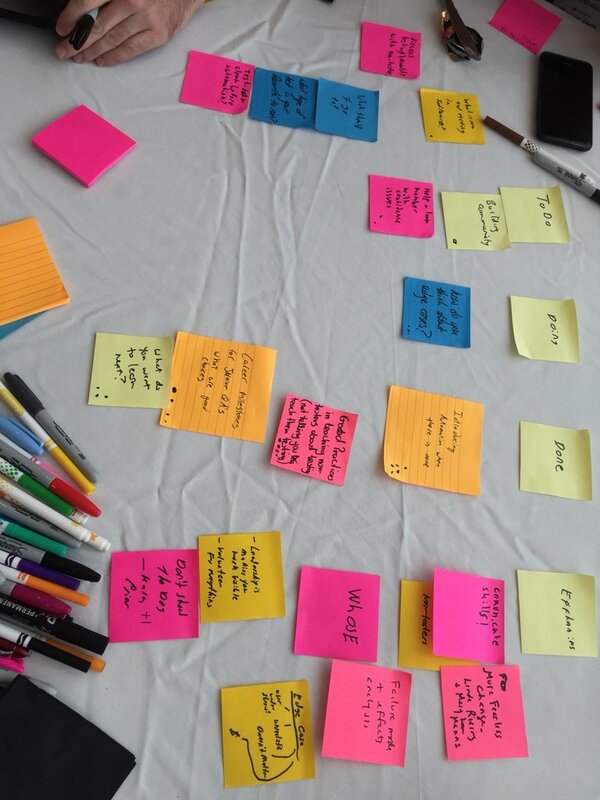 Also, this was my first lean coffee where there was actual coffee. Then, the opening keynote. Liz Keogh was speaking about Cynefin, and delivered a great talk. I did hear a similar version of this in ETC2017, but it did not matter very much. In fact, listening twice enabled me to better understand and process what she was speaking about. In short - developing software is complex space, probe a lot and make sure that your probes are safe to fail. Also, use BDD and avoid tools such as Cucumber (BDD is about the conversation, not about the feature files). After the keynote I went to a workshop on domain testing passed by Chris Kenst and Dwayne Green. It's always nice to refresh the fundementals, and to learn a new name for that (I was familiar with the concept of Equivalence classes and boundary value analysis, that are techniques inside the space of domain testing). During lunch I managed to talk a bit with some people, and then went on to the lobby where I met Alex and we've talked about organizing your desktop in a way that should (we guess) increase productivity. What I really liked was that we actually started mocking the screen layout that we would want to see. It was very cool to watch Alex tear down some paper pieces so that it would be easy to move them around. This sort of think kind of makes me want to go out and figure how to implement such a thing. The main challenge is that in order for such a solution to work, it must be ingrained in the OS is a seamless way, so that it will always be on top, and manage the size of just about everything else. I wonder if Windows are already offering such a thing. The first talk I attended had a promising title about coaching and the GROW framework. It took me a while to find out that I didn't connect with the content and move to another talk - "Don't take it personally" by Bailey Hanna. I got just in time for the exercise. Not really knowing what I should do, my instruction was "be aggressive", and I do owe Polina another apology. I was very difficult. After that, I went to Lisi's talk about her test journey. So far, I've listened to two of Lisi's talks, and they have been very dangerous to my free time. Lisi has a way of sharing her experience while showing her passion for what she did, and has a unique way of inspiring others to do the same. It was my favorite session of the day. Also, before having a chance to regret this, I agreed with Alex on pairing together, and we decided that by the end of August we will set up a time for a session. My talk was up next, and I took my usual 5 minutes to stress out. The talk itself went ok, I think - By the end of it I felt as if I was pushing a bit hard to hold the list of ideas as coherent a narrative as I could, but I wonder how many in the audience actually saw it. The open season was, as expected for the time and type of talk - awkward silence. My facilitator at the talk - the Friendly Richard Bradshaw managed an amazing feat of wriggling some questions out of the audience, and had some interesting questions himself. After the talk I got some very kind feedback, which I greatly appreciate. A surprise was set for the evening - after a short time to meet & mingle, we all (or, up to a 100 of us) got on a bus and took of to the Kennedy space center. Rockets, space, astronauts, nice company (and even some food) - what more can one ask? We got back to the hotel and I joined a couple of quick rounds in a card game I don't know the name of but was nice to play. Tired, I returned to my room and started writing this post, which, as you can see, I did not manage to complete before the conference was over. Still, a whole lot more was waiting for me in the second day, but that's for another post that I hope to get on seen - there's still a week of vacation ahead of me, and I intend to make the most out of it.